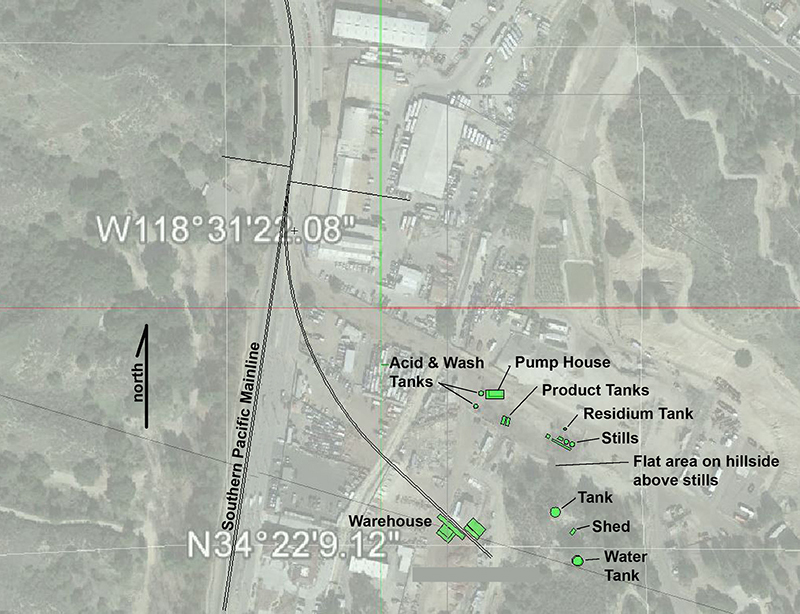 SCVHistory.com HB1714 | Newhall | Andrew's Station; Andrews Plat; Pioneer Oil Refinery Layout. Top: Undated plat map showing a 1,000-foot spur line leading to a platform where oil from Pico Canyon was loaded into railroad tank cars. Note that north is to the left. 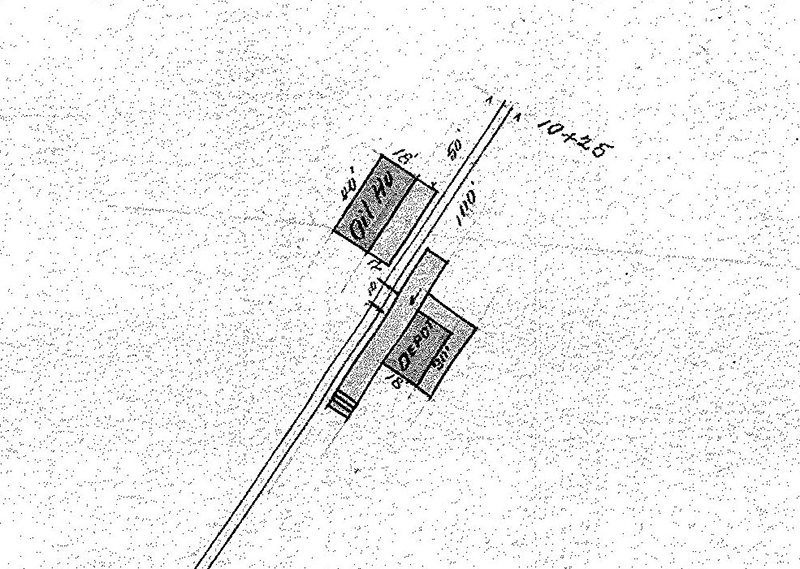 The platform was located between today's Pine Street and the Pioneer Oil Refinery, slightly south of a straight line. See diagram below. It is unknown when the spur was put in. According to a Southern Pacific Transportation Co. map showing all of the Southern Pacific's real estate transactions in the Newhall and Saugus area between 1876 (when the railroad came through) and 1992, the spur existed prior to 1916. The spur and associated buildings sat on 11,026 acres of land owned by Standard Oil — the successor company to California Star Oil Works, which operated the adjacent refinery from 1877 to 1888 when it was shuttered. The original sale or lease agreement from Standard Oil (or its predecessor) was lost; it was replaced with a supplemental agreement dated July 23, 1926. It was likely a zero-dollar lease or use agreement, considering the oil company derived all of the benefit from having a spur line on its property. The building identified on the map as "depot" was not a rail passenger depot. It was a facility where petroleum and/or petroleum products were housed until a train arrived to pick them up. If the spur existed prior to 1888, it would have been the point of embarkation for locally refined products such as kerosene, benzene and naptha; after 1888 it was the point from which raw petroleum was shipped to refineries elsewhere. 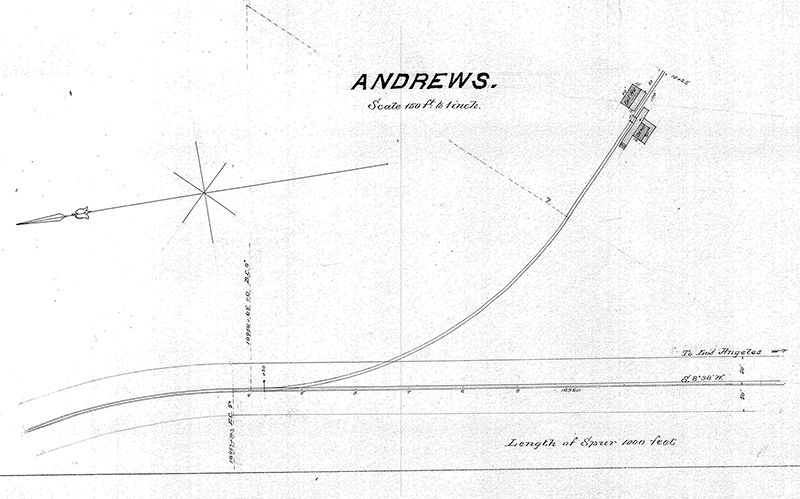 "Andrews" relates to Andrew's Station. 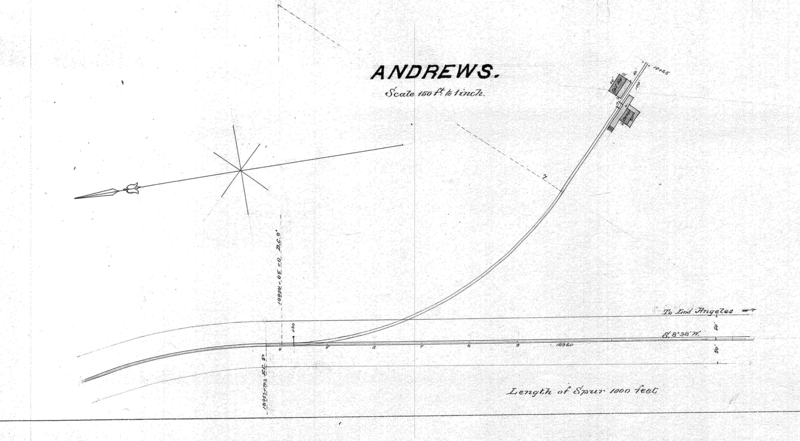 According to local historian Stan Walker, based on photographic evidence (above) and a traveler's report from 1877 (San Francisco Chronicle, May 28, 1877), Andrew's Station was located slightly north of this spur line, roughly at today's Newhall Avenue, just east/south of the Pine Street intersection. Andrew Kraszynski built the station around June 1875. 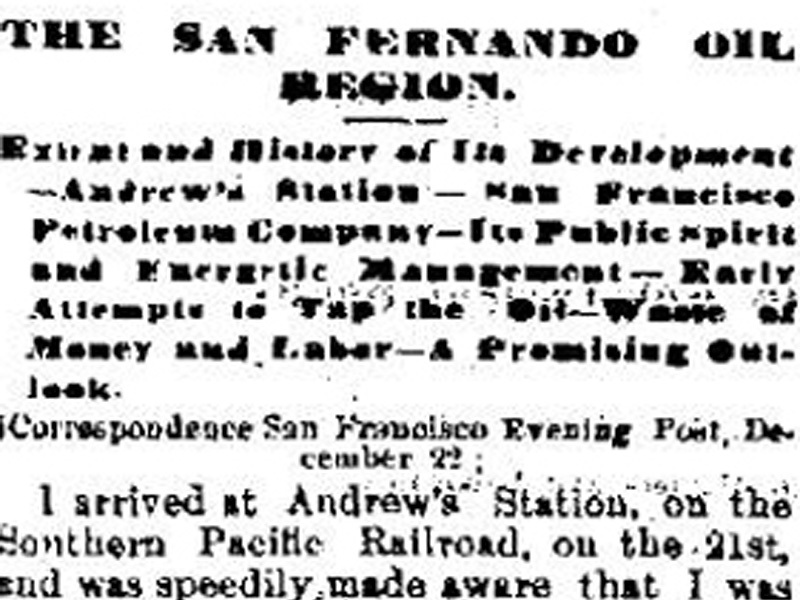 He would have known the railroad was coming; work started March 22, 1875, on the San Fernando railroad tunnel in Railroad Canyon (end of today's Pine Street). The alignment would bypass the preexisting Lyon's Station, which was located at today's Eternal Valley Cemetery near the northern base of Beale's Cut. Kraszynski would have known, or could have surmised, that the rail line would emerge from the train tunnel and pass right by the place he picked out for a hotel, which reportedly had 17 rooms. In the meantime, his station would have accommodated stagecoach traffic and mail service along the stage line to the "Tulares," i.e., from Los Angeles over Beale's Cut and north through San Francisquito Canyon to the San Joaquin Valley. It's probably safe to speculate that he intended for his station to sit at the intersection of the stage line and the rail line. He got it almost right. A Carleton Watkins photo — probably from June 26, 1877, the day Watkins photographed the Pico oil works — shows a small building (not Andrew's Station) on the main line in the Andrews area. According to the aforementioned 1877 report, rail passengers destined for Andrew's Station got off the train, probably at the building in the Watkins photo, and had to walk or ride a distance of one-eighth mile to reach the hotel. The good times were short-lived for Andrew Kraszyinski and and his brother Maurice. A town never built up around their hotel. Instead, the town of Newhall moved from its original 1876 location at today's Bouquet Junction to the current Old Town Newhall area in early 1878. Unlike Andrew's, the Newhall depot sat right on the main line, and directly across from it in that same year, Henry Mayo Newhall built his lavish Southern Hotel. Andrew's Station was relegated to second-class status as the little hotel that was slightly off the beaten path. Its post office was discontinued in 1879, and by 1884, according to Walker, Andrew Kraszynski was in Arizona and Maurice was in San Francisco. 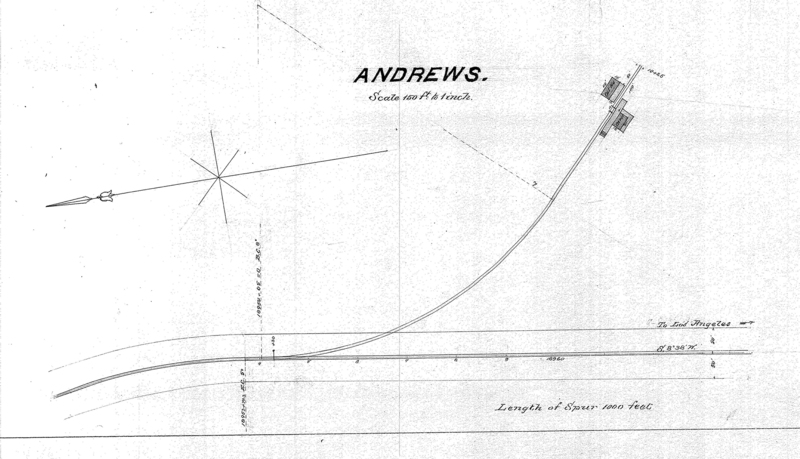 "I have seen no newspaper articles past the early 1880s that mention Andrew's Station," Walker writes. The spur line lasted considerably longer. Citing personal communication with railroad historian Don Ball, Walker writes: "After the refinery was shut down, Standard continued to store oil from other locations in the tanks above the refinery. That oil would still be loaded onto the train from the spur and shipped out. Standard quit doing this around 1943." According to the Southern Pacific real estate map, the spur was removed in 1941. Aerial photography confirms it was gone by 1945. Contrary to other published information on this website — before we knew what we know now — oil was probably never shipped out of Andrew's Station. It was shipped from the spur. Diagram by Thomas R. Knapp, AIA. To avoid confusion, we have removed the words "Andrew's Station," which was misidentified in the original version of this diagram. Click to enlarge. Photograph by Stan Walker, June 26, 2016, from the same vantage point as the Carleton Watkins photos from 139 years earlier. 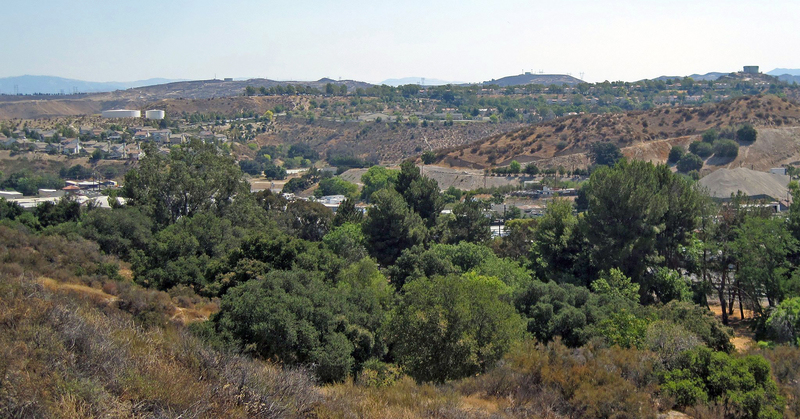 Walker is standing on a hill in the "back campground" area at William S. Hart Park, looking east. Click to enlarge. Detail from plat. North is to the left. HB1714: Maps and photos courtesy of Stan Walker and Thomas R. Knapp, AIA. Online only.